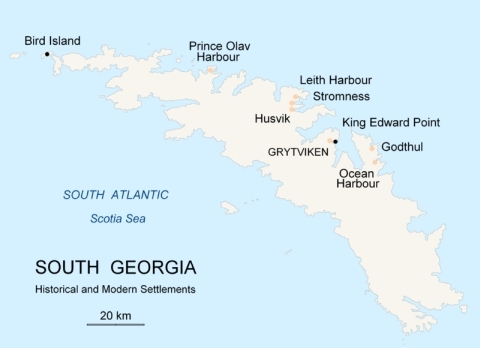 Grytviken (Swedish for 'Pot Cove') is the principal settlement in the United Kingdom territory of South Georgia in the South Atlantic. It was so named by a 1902 Swedish surveyor who found old English try pots used to render seal oil at the site. It is the best harbour on the island, consisting of a bay (King Edward Cove) within a bay (Cumberland East Bay). The site is quite sheltered, provides a substantial area of flat land suitable for building on, and has a good supply of fresh water. 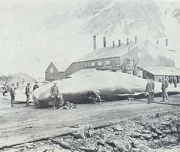 The settlement at Grytviken was established on November 16, 1904, by the Norwegian sea captain Carl Anton Larsen as a whaling station for his Compañía Argentina de Pesca (Argentine Fishing Company). It was phenomenally successful, with 195 whales taken in the first season alone. The whalers used every part of the animals - the blubber, meat, bones and viscera were cooked to extract the oil and the bones and meat were turned into fertilizer and fodder. Elephant seals were also hunted for their blubber. Around 300 men worked at the station during its heyday, operating during the southern summer from October to March. A few remained over the winter to maintain the boats and factory. Every few months a transport ship would bring essential supplies to the station and take away the oil and other produce. The following year the Argentine Government established a meteorological station. Carl Anton Larsen, the founder of Grytviken, was a naturalised Briton born in Sandefjord, Norway. In his application for British citizenship, filed with the British Magistrate of South Georgia and granted in 1910, Captain Larsen wrote: "I have given up my Norwegian citizens rights and have resided here since I started whaling in this colony on the 16 November 1904 and have no reason to be of any other citizenship than British, as I have had and intend to have my residence here still for a long time." His family in Grytviken included his wife, three daughters and two sons. 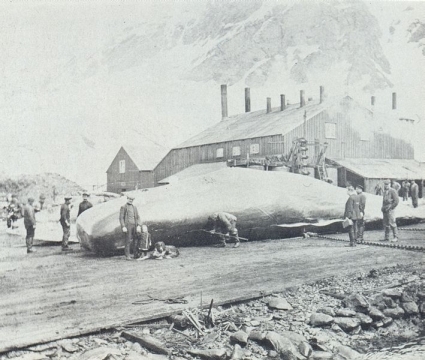 As the manager of Compania Argentina de Pesca, Larsen organised the construction of Grytviken, a remarkable undertaking accomplished by a team of sixty Norwegians between their arrival on November 16, and commencement of production at the newly built whale-oil factory on December 24, 1904. Larsen chose the whaling station's site during his 1902 visit while in command of the ship Antarctic of the Swedish Antarctic Expedition (1901-03) led by Otto Nordenskjöld. 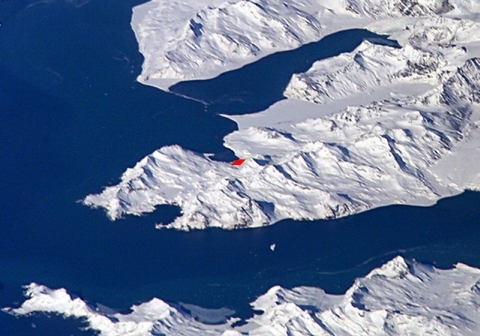 On that occasion, the name Grytviken ('Pot Cove') was given by the Swedish archaeologist and geologist Johan Gunnar Andersson who surveyed part of Thatcher Peninsula and found numerous artifacts and features from sealers' habitation and industry, including a shallop (a type of small boat) and several try-pots used to boil seal oil. One of those try-pots, having the inscription 'Johnson and Sons, Wapping Dock London' is preserved at the South Georgia Museum in Grytviken. Managers and other senior officers of the whaling stations often had their families living together with them. Among them was Fridthjof Jacobsen whose wife Klara Olette Jacobsen gave birth to two of their children in Grytviken; their daughter Solveig Gunbjorg Jacobsen was the first child ever born in Antarctica, on October 8, 1913. Several more children have been born on South Georgia: recently even aboard visiting private yachts. The whale population in the seas around the island was substantially reduced over the following sixty years until the station closed in December 1966, by which time the whale stocks were so low that their continued exploitation was unviable. Even now, the shore around Grytviken is littered with whale bones and the rusting remains of whale oil processing plants and abandoned whaling ships. 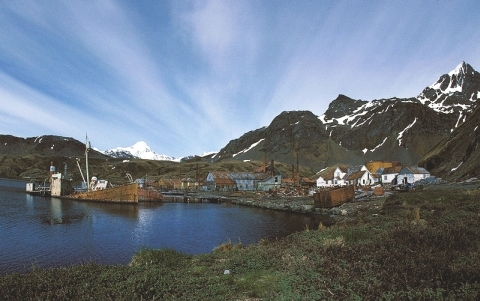 Grytviken is closely associated with the Anglo-Irish explorer Ernest Shackleton. Shackleton's most famous expedition set out from London on August 1, 1914, to reach the Weddell Sea on January 10, 1915, where the pack ice closed in on their ship, the Endurance. The ship was broken by the ice on October 27, 1915. The 28 crew members managed to flee to Elephant Island, off Antarctica, bringing three small boats with them. All of them survived after Shackleton and five other men managed to reach the southern coast of South Georgia in the James Caird. They arrived at Cave Cove, and camped at Peggotty Bluff, from where they trekked to Stromness on the northeast coast. From Grytviken Shackleton organised a rescue operation to bring home the remaining men. He again returned to Grytviken, but posthumously, in 1922. He had died unexpectedly from a heart attack at sea at the beginning of another Antarctic expedition, and his widow chose South Georgia as his final resting place. His grave is located south of Grytviken, alongside those of the whalers who died on the island. During the Falklands War, Grytviken was captured by Argentine forces in early April 1982 following a brief battle with British Royal Marines. The Royal Marines, SAS and SBS retook the settlement three weeks later without a shot being fired. Joined by the corvette ARA Guerrico on April 3, 1982, the ARA Bahia Paraiso attacked the platoon of 22 Royal Marines deployed at Grytviken. The two-hour battle resulted in the ARA Guerrico being severely damaged and an Argentine helicopter Puma shot down. The Argentine forces sustained 3 men killed and a similar number of wounded, with one wounded on the British side. The British commanding officer Lieutenant Keith Mills was awarded a Distinguished Service Cross for the defence of South Georgia. While the British Magistrate and other civilians and military present in Grytviken were removed from South Georgia, another 15 Britons remained beyond Argentine reach. The losses suffered at Grytviken prevented Argentina from occupying the rest of the island, with Bird Island base, and field camps at Schlieper Bay, Lyell Glacier and St. Andrews Bay remaining under British control. On April 25, the Royal Navy damaged and captured the Argentine submarine ARA Santa Fe at South Georgia. The Argentine garrison in Grytviken surrendered without returning the fire. The following day the detachment in Leith Harbour commanded by Captain Alfredo Astiz also surrendered. Finally, the Argentine personnel were removed from the South Sandwich Islands by HMS Endurance on June 20. Due to evidence of an unauthorised visit, the closed station Corbeta Uruguay was destroyed in January 1983. Along with the surrounding area, the station has been declared an Area of Special Tourist Interest (ASTI). 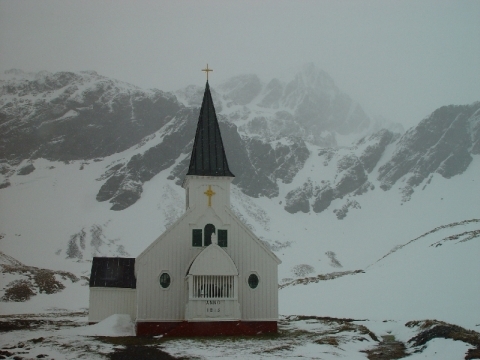 Grytviken is a popular stop for cruise ships visiting Antarctica, and tourists usually land to visit Shackleton's grave. There is a small museum in part of the former whaling station, which is open during the summer tourism season. The station's church is the only building which retains its original purpose, and is still used occasionally for services. There have been several marriages in Grytviken, with the first one being registered on February 24, 1932, between A. G. N. Jones and Vera Riches, and a most recent one on February 19, 2006, between Peter W. Damisch and Lesley J. Friedsam. On January 28, 2007, a service was conducted in remembrance of Anders Hansen (Norwegian whaler buried at Grytviken cemetery in 1943) and to celebrate his great-great-grandson Axel Watto Eide's baptism occurring in Oslo, Norway, the same day. This page was retrieved and condensed from (http://en.wikipedia.org/wiki/Grytviken) see Wikipedia, the free encyclopedia, April 2009. This information was correct in April 2009. E. & O.E.